Alkaline and strong cleaning agent with active ingredients that removes persistent stains from oils and grease, grime and soot. It removes ink from cuttlefish and squid without any scrubbing, even when they penetrated through the pores of the surface. It removes hard sediment and microorganisms from boat hulls as well as seagull waste. Necessary for general boat cleaning. It revives and restores the original bright white color of gel coat. 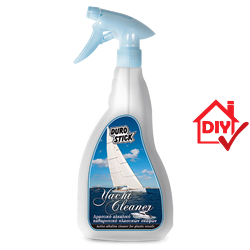 It cleans deeply and removes scum, black spots and yellow stains from upholstery and boat bumpers as well. Ideal for cleaning lavatories and showers, faucets and sinks, as well as plastic tables, chairs and tarps.